Herbal teas—less commonly called tisanes (UK and US /tɪˈzæn/, US also /tɪˈzɑːn/)—are beverages made from the infusion or decoction of herbs, spices, or other plant material in hot water. They do not usually contain caffeine. Herbal teas should not be confused with true teas (e.g., black, green, white, yellow, oolong), which are prepared from the cured leaves of the tea plant, Camellia sinensis), nor with decaffeinated tea, in which the caffeine has been removed. Like beverages made from true teas, herbal teas can be served hot or cold. Herbal Tea “has a long history from Southern China, especially in Guangdong Province. Because of the weather of the southern China was damp heat “濕熱” and many people having a business activity here so that If they feel sick, they will drink a cup of Herbal Tea ”涼茶”. According to the earliest record of Guangdong, Herbal Tea was appeared from the Yuan Dynasty before 1751″公元1751年前元代的” AD <<嶺南衛生方>>. Also, they will name the Heat soup”清熱的湯” as a cold medicine”涼藥”. However, because of the meaning of the medicine, Chinese did not like the meaning of medicine so that they changed the name as Herbal Tea in Qing Dynasty “清代”. The ancestor of herbal tea is Wong Lo Kat “王老吉” , it was created by Wang Zebang “王澤邦” in 1828. The operation style of the earliest herbal tea shop was Street vendors “路邊攤”, they will selling on the street. In 1869, Herbal Tea was appeared in Hong Kong. On May 28, 2006, the herbal tea was formally approved and published as a national intangible cultural heritage. Some feel that the term tisane is more correct than herbal tea or that the latter is even misleading, but most dictionaries record that the word tea is also used to refer to other plants beside the tea plant and to beverages made from these other plants. In any case, the term herbal tea is very well established and much more common than tisane. The word tisane was rare in its modern sense before the 20th century, when it was borrowed in the modern sense from French. (This is why some people feel it should be pronounced /tɪˈzɑːn/ as in French, but the original English pronunciation /tɪˈzæn/ continues to be more common in US English and especially in UK English). The word had already existed in late Middle English in the sense of “medicinal drink” and had already been borrowed from French (Old French). The Old French word came from the Latin word ptisana, which came from the Ancient Greek word πτισάνη (ptisánē), which meant “peeled” barley, in other words pearl barley, and a drink made from this that is similar to modern barley water. Comfrey, which contains alkaloids which may be harmful to the liver from chronic use, and particularly is not recommended during pregnancy or when prescription drugs are used; comfrey is not recommended for oral use. Lobelia, which contains alkaloids and has traditional medicine uses for smoking cessation, may cause nausea, vomiting, or dizziness at high doses. Herbal teas can also have different effects from person to person, and this is further compounded by the problem of potential misidentification. The deadly foxglove, for example, can be mistaken for the much more benign (but still relatively toxic to the liver) comfrey. The US does not require herbal teas to have any evidence concerning their efficacy, but does treat them technically as food products and require that they be safe for consumption. Fruit or fruit-flavored tea is usually acidic and thus may contribute to erosion of tooth enamel. Depending on the source of the herbal ingredients, herbal teas, like any crop, may be contaminated with pesticides or heavy metals. According to Naithani & Kakkar (2004), “all herbal preparations should be checked for toxic chemical residues to allay consumer fears of exposure to known neuro-toxicant pesticides and to aid in promoting global acceptance of these products”. 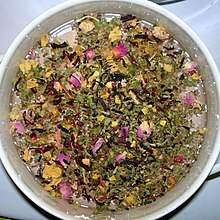 Herbal teas can be made with fresh or dried flowers, leaves, seeds or roots. They are made by pouring boiling water over the plant parts and letting them steep for a few minutes. Seeds and roots can also be boiled on a stove. The herbal tea is then strained, sweetened, if desired, and served. Many companies produce herbal tea bags for such infusions. This retail mixture contains rooibos, coconut, ginger, cinnamon, apple, cardamom, black pepper and almond. Apple, rose hips, orange zest, papaya, peppermint, liquorice root, lemon grass, cinnamon, blackcurrants, rose and mallow blossoms. A bottled herbal tea made from ginseng. A close-up of a rooibos blend in a tea bag being steeped. Chamomile, commonly used for sore stomach, irritable bowel syndrome, and as a gentle sleep aid. [unreliable medical source?] It is also used as a mild laxative and is anti-inflammatory and bactericidal. Coca tea, infusion made from coca leaves. Contains trace amounts of cocaine and similar alkaloids. In some countries where coca is illegal, products marketed as “coca tea” are supposed to be decocainized, i.e., the pharmacologically active components have been removed from the leaf using the same chemicals used in manufacturing cocaine. Coffee-leaf tea, coffee cherry tea, and coffee blossom tea are herbal teas made using the leaves, cherries and flowers of the coffee plant; in coffee the coffee beans (seeds) are instead used. Honeybush, similar to rooibos and grows in a nearby area of South Africa, but tastes slightly sweeter. Has a low tannin content, no caffeine. Hydrangea tea, dried leaves of hydrangeas; considerable care must be taken because most species contain a toxin. The “safe” hydrangeas belong to the Hydrangea serrata Amacha (“sweet tea”) Cultivar Group. Kava root, from the South Pacific, commonly used for its effects in promoting talkativeness and relaxation. As well, kava extracts may be an effective alternative to tricyclic antidepressants and benzodiazepines for the treatment of anxiety disorders. Kratom, dried leaves of the Kratom tree, drank for its medicinal and stimulant effects. Mountain Tea, a very popular tea in the Balkans and other areas of the Mediterranean region. Made from a variety of the Sideritis syriaca plant which grows in warm climates above 3,000 feet. Records of its use date back 2,000 years. Oksusu cha, traditional roasted corn tea found in Korea. Osmanthus tea, dried flowers of the sweet olive tree are used alone or blended with tea leaves in China. Rooibos (Red Bush), reddish plant used to make an infusion and grown in South Africa. In the US it is sometimes called red tea. It has many of the antioxidant characteristics of green tea, but because it does not come from tea leaves, it has no caffeine. Sassafras roots were steeped to make tea and were used in the flavoring of root beer until being banned by the FDA. Thyme, contains thymol, an antiseptic used in mouthwashes such as Listerine. Valerian is used as a sedative. ^ a b “Google Ngram Viewer”. Retrieved 2018-05-29. ^ a b “Cambridge Advanced Learner’s Dictionary”. Dictionary.cambridge.org. 2018-05-23. Retrieved 2018-05-29. ^ “Herbal tea”. Dictionary.reference.com. Retrieved 2014-05-04. ^ 莲酱;. “小味道|在快要消失的凉茶老铺，叹一碗甘苦人情滋味”. 莲酱. Retrieved 2019-03-04. ^ . “小味道|在快要消失的凉茶老铺，叹一碗甘苦人情滋味”. 莲酱. Retrieved 2019-03-04. ^ 華人百科;. “王澤邦”. 華人百科. Retrieved 2019-03-04. ^ Hong Kong Memory;. “涼茶小販”. Hong Kong Memory. Retrieved 2019-03-04. ^ . “香港涼茶文化的發展歷程”. Hong Kong Memory. Retrieved 2019-03-04. ^ 南方网;. “清心堂”凉茶秘方及术语”被认定为首批国家级非物质文化遗产”. 南方网. Retrieved 2019-03-04. ^ . “Merriam-Webster.com”. Merriam-Webster.com. Retrieved 2018-05-29. ^ “tea – Definition of tea in English by Oxford Dictionaries”. Oxford Dictionaries – English. ^ “Comfrey”. Drugs.com. 3 January 2018. Retrieved 5 January 2018. ^ “Lobelia”. Drugs.com. 3 January 2018. Retrieved 5 January 2018. ^ O’Toole, S.; Mullan, F. (2018). “The role of the diet in tooth wear” (Submitted manuscript). British Dental Journal. 224 (5): 379–383. doi:10.1038/sj.bdj.2018.127. PMID 29471309. ^ a b Naithani, V; Kakkar, P (2004). “An evaluation of residual organochlorine pesticides in popular Indian herbal teas”. Archives of Environmental Health. 59 (8): 426–30. doi:10.3200/AEOH.59.8.426-430. PMID 16268119. ^ Naithani, V; Kakkar, P (2005). “Evaluation of heavy metals in Indian herbal teas”. Bulletin of Environmental Contamination and Toxicology. 75 (1): 197–203. doi:10.1007/s00128-005-0738-4. PMID 16228893. ^ “Chamomile (Matricaria Recutita)”. herbwisdom.com. Retrieved 15 October 2014. ^ Bhaskaran N, Shukla S, Srivastava JK, Gupta S (2010). “Chamomile: an anti-inflammatory agent inhibits inducible nitric oxide synthase expression by blocking RelA/p65 activity”. International Journal of Molecular Medicine. 26 (6): 935–40. doi:10.3892/ijmm_00000545. PMC 2982259. PMID 21042790. ^ Tayel AA, El-Tras WF (2009). “Possibility of fighting food borne bacteria by egyptian folk medicinal herbs and spices extracts”. The Journal of the Egyptian Public Health Association. 84 (1–2): 21–32. PMID 19712651. ^ Jenkins AJ, Llosa T, Montoya I, Cone EJ (1996). “Identification and quantitation of alkaloids in coca tea”. Forensic Science International. 77 (3): 179–89. doi:10.1016/0379-0738(95)01860-3. PMC 2705900. PMID 8819993. ^ “As ginseng prices soar, diggers take to the backcountry”. Fox News. 2012-09-28. Retrieved 28 September 2012. ^ C.J. van Gelderen; D.M. van Gelderen. 2004. Encyclopedia of Hydrangeas. Timber Press. 280 p.
^ Pittler MH, Ernst E (2000). “Efficacy of kava extract for treating anxiety: systematic review and meta-analysis”. Journal of Clinical Psychopharmacology. 20 (1): 84–9. doi:10.1097/00004714-200002000-00014. PMID 10653213. ^ Volz HP, Kieser M (1997). “Kava-kava extract WS 1490 versus placebo in anxiety disorders–a randomized placebo-controlled 25-week outpatient trial”. Pharmacopsychiatry. 30 (1): 1–5. doi:10.1055/s-2007-979474. PMID 9065962. ^ Suwanlert, Sangun (1975). “A Study of Kratom Eaters in Thailand”. Bulletin on Narcotics. 27 (3): 21–27. PMID 1041694. ^ Jansen KL, Prast CJ (1988). “Ethnopharmacology of kratom and the Mitragyna alkaloids”. Journal of Ethnopharmacology. 23 (1): 115–9. doi:10.1016/0378-8741(88)90121-3. PMID 3419199. ^ Sienkiewicz M, Łysakowska M, Ciećwierz J, Denys P, Kowalczyk E (2011). “Antibacterial activity of thyme and lavender essential oils”. Medicinal Chemistry. 7 (6): 674–89. doi:10.2174/157340611797928488. PMID 22313307. ^ Boullata JI, Nace AM (2000). “Safety issues with herbal medicine”. Pharmacotherapy. 20 (3): 257–69. doi:10.1592/phco.20.4.257.34886. PMID 10730682.